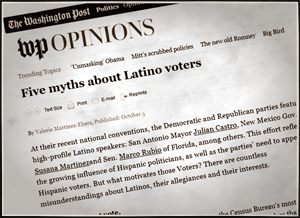 Sunday's Washington Post ran its "5 Myths" feature on the topic of Latino voters. It wasn't too biased and is worth a read. Looking at a few of the points made in this item, written by a Hispanic political scientist in Texas, perhaps the most important one was exposing the myth that "Latinos are social conservatives who should lean Republican." The writer starts with the assumption that Latinos hold conservative positions on major social issues like homosexual marriage and abortion. Even if there's truth to this claim about social issues, the item goes on to note — accurately — "these issues do not predict the party they affiliate with". The writer cites the Pew Research Center's finding that Latinos are 3-to-1 Democrats over Republicans. Further, it's noted that "this is not a monolithic voting bloc". Those of Cuban descent align more heavily with the GOP, while Puerto Ricans are heavily Democrat. Not discussed in the brief Post item, but certainly true, is the fact that if Hispanics were natural Republicans who lack only party or candidate outreach, then California should be the biggest purple state on the map. Rather, the number one destination of immigrant settlement for generation upon generation is the deepest of blue states. It's no longer competitive politically. Immigrants, largely Latino, for a half-century have effectively aided in turning California into an ungovernable, one-party welfare state. It's the sleepiest state in the nation in this tightly contested presidential campaign, getting no presidential campaign ads compared with toss-up states like Iowa, New Hampshire, Ohio, and Virginia, where you can't turn on the TV or radio or log onto many websites without campaign ad saturation. And there's no evidence that all those "socially conservative" Latino voters in California select candidates based on those issues. Otherwise, more of California's elected officials would reflect such values. In fact, California's Latino electorate sends to the state assembly and to Washington (and to local offices) liberal Democrats. Undoubtedly, this segment of Golden State voters is augmented by San Francisco Bay Area far-leftists, the Hollywood crowd, enviros, Silicon Valley libertarians who regard themselves as politically "progressive", and others among the state's "fruits and nuts". But that supports the point that rather than serving as a social conservative counterweight, Latino immigration has merely furthered the leftward tilt of the state's electorate. This fact rebuts one of the "5 Myths" points. The writer marshals an argument that somehow Latinos aren't "reliable Democratic voters". She acknowledges their longstanding pattern of overwhelmingly backing Democrats. My point about this bloc's voting for statist-friendly politicians trumping votes for those running on hot-button social issues even gets made in this part of the Post item. The writer admits that "Latinos support increasing government services". And the example of Latino electoral allegiance to Democrats not being reliable suffers from picking as her example perhaps the worst Democratic incumbent ever to seek re-election: Jimmy Carter in 1980, when he got just 56 percent of the Hispanic vote. Yet that's still a sizable majority of what then was a puny voting bloc. The Post item also argues that Latino voters aren't consumed with the immigration issue. This is generally correct. Most polls show that, when asked what the top priority issues facing the country are, Hispanic voters don't typically start with immigration. Rather, these voters are most concerned with jobs and the economy, as the Post writer says. Polls have found these voters ranking issues like education ahead of immigration. These are aspirational issues — things that relate to a better life and future for one's children. This indicator of biggest concerns should give Republicans some hope, because the GOP messages on the issues of job opportunity, economic strength, better schools for our kids, etc. are much more salient with Latin Americans, and more effective than pandering on amnesty and irresponsible levels of immigration. But one more point from the "5 Myths" article is worth noting. Large-volume Hispanic immigration doesn't serve Republican long-term interests — nor the interests of the United States generally. It says Susana Martinez only won 38 percent of New Mexico's Latino vote in 2010 when she ran for governor. Likewise, Marco Rubio only got a majority of Hispanic votes in Florida because of Cuban-Americans and, taking out his own group, "Rubio won only 40 percent of the [non-Latino] vote." It's hard to get to E Pluribus Unum when more than a million new immigrants legally get visas each year and another half-million illegals settle here annually. America's future success hinges on assimilation and more rapid climbing up the economic ladder (by good, old-fashioned individual hard work instead of racial quotas, redistributionist programs, and other manifestations of the politics of envy). Newcomers need to plunge themselves "all in" as Americans, devoting themselves to becoming members in good standing of their new homeland. You can't get there from here with such a huge constant inflow of new foreigners. Volume alone freezes Americanization and accumulation of social capital. Those in both parties who are still patriotic and willing to put country above party should admit this obvious fact and do something about it in Washington.